EasyCall is a wireless customer paging system that allows guests to summon staff anywhere on site. The EasyCall units are attractive, IP rated, tough and compact micro buttons. A single button-press signals the base station that a customer needs attention. EasyCall allows restaurants, hotels, pubs, clubs, garden centres and leisure facilities to 'expand' service out of doors more easily, capturing extra business that might otherwise be lost when customers are outside. Other proven industry uses include: changing rooms in clothing retail stores, airport executive lounges, private residencies, luxury yachts, theatre boxes and consultation rooms in opticians and doctors surgeries. 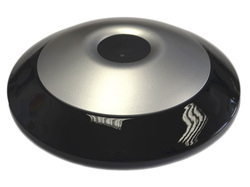 ﻿Positioned unobtrusively on a table or fitted to a wall, EasyCall is a unique dedicated communication system designed for service industries and sectors. At the touch of a button, EasyCall transmits a signal to a staff pager enabling an immediate response. The pagers feature a vibrate or tone alert option and can also display the room or area that requires service. Overall service levels will be improved by rapid response times, increasing customer satisfaction. Major hospitality organisations find EasyCall an invaluable aid in winning customer loyalty. EasyCall offers two button options. One is the size of a £2 coin and can be counter sunk into a table top or a custom designed menu stand and the other is 11cm in diameter which can surface mounted with an optional menu holder. Some options are IP rated weatherproof and suitable for outdoor conditions. Customers simply push a button when they require service. A signal is transmitted directly to a light display panel or to an alphanumeric pager, which indicates the table number requiring service.